In Tennessee, drivers can purchase certain* Specialty License Plates in place of the normally issued state license plate. A portion of the proceeds from the sale of these plates supports the organization featured so it’s a great opportunity to support the cause you care about most. 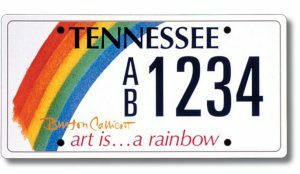 Tennessee also permits the personalization of any plate with up to the amount of characters available on the plate. Choose a unique phase or name for your license plate and stand out from the crowd. The new Gift-A-Tag voucher program is an opportunity to purchase gift vouchers for Specialty License Plates or the personalization of a plates. It makes a great gift for graduates, family members, board members or treat yourself. You can get a new license plate anytime—not just when your tags expire. Your tag fee will be prorated. For more information, please visit www.tnspecialtyplates.org/about. Certain criteria must be presented to be eligible for some Specialty License Plates such as emergency services or military.